The Bombay Duck is a fish, so called because it is only found in the Arabian Sea, mainly off the coast of Bombay. The characteristic flavour of this sun-dried fish makes this pickle, which is cooked in spices, oil and vinegar, truly one-of-a-kind. 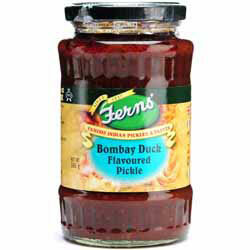 Ferns' Pickles & Chutneys are unique because of their special mode of manufacture. Fresh fruits and vegetables are prepared with spices, oil and vinegar and cooked to give them this special flavour. Use as an accompaniment to add zing to your meals, or pep up snacks and sandwiches. Ingredients: Onions, Water, Suagr, Sesame Oil, Salt, Chilli Powder, Vinegar, Bombay Duck Flavouring (2.5%), Cumin Powder, Turmeric Powder, Split Mustard. Use the 'quick search' facility at the top of this page to locate other wonderful Ferns' products available from Spices of India. "Dear Spices of India, What a service! Placed my order late on a Sunday evening, goods arrived at my door 08:45 on the Tuesday. Extremely happy with the contents. Thanks to all at Spices of India"